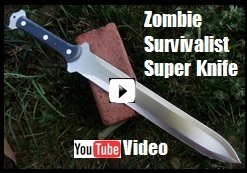 Zombie Survivalist Super Knife. See Pictures, Prices, and Descriptions. Made by Scorpion Swords & Knives. With a blade design similar to early ancient Roman Gladius swords, it is very useful for stabbing, cutting, and slashing.